The Deichman library in Oslo. Liberal Greek revival, Nils Reiersen 1933. During the course of architectural history, it has happened any times that the aesthetic ideals of an early period have once again become important. Different styles, such as Gothic, Egyptian, Baroque and not at least, Classicism, have haunted the drawing boards of architects in different versions even up until today. Bragernes church in Drammen. Backsteingotik revival, Ernst Norgrenn 1872. Viewing something from a distance provides a person with a certain clarity, an overview which can be hard to obtain when you're in the middle of it. For this reasons, revivals can, in my opinion, be just as great as the originals, although maybe in a different way. Taking a step back has its drawbacks, but that shouldn't be a reason to back off and not to try to do something which you believe would be great. National Bank of Greece in Nafplio. Mycenaean (!) revival, Zouboulidis ca 1930. This blog has been dormant for many months now, not unlike an architectural language which is abandoned in favour of another, but still stays there, behind the curtains. And this is my attempt at a revival of what Not Another Architecture Student has been. Throughout three years of studies, the blog has been my incidental diary for architectural discoveries, a place to scribble down new ideas, a channel for pouring out love and hate in the realm of buildings and cities, and a way to come in contact with some interesting people. Helga Eng's Hall, Blindern. Playful functionalist revival, LMR arkitektur 1994. I have now finished the first part of my masters degree in architecture, equivalent to an undergraduate or bachelors degree. During the year to come, I will work full-time as a paid intern in a very interesting architectural firm called LMR arkitektur. Although a relatively old company, they are a curious and innovative bunch, and I'm looking very much forward to learning from them and contributing with what I may have. University library at Blindern. Monumentalist revival? 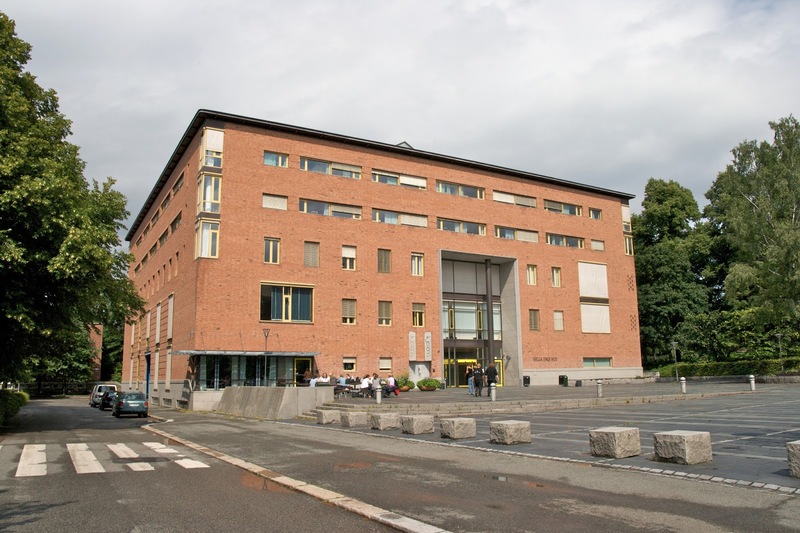 LMR arkitektur 1999. In the year to come, this blog will again become important. Moving home to Oslo will provide me with a new perspective, and new objects to investigate. One of the places I really want to explore, is the university campus, which goes by the name of Blindern, named after the former farm whose land it now occupies. This is a strange and wonderful place, full of ugly buildings and beautiful parks, loved by many for their contents and by few for their looks and interface. I will probably return to Bergen next fall, but I'll also apply to do my masters at other schools, so nothing is certain. Wish me luck! 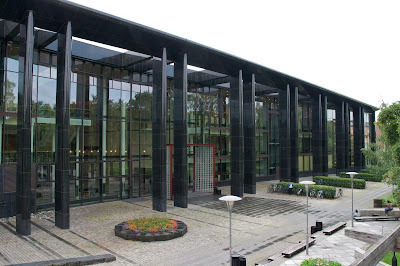 University library at Blindern. Treetrunk revival? 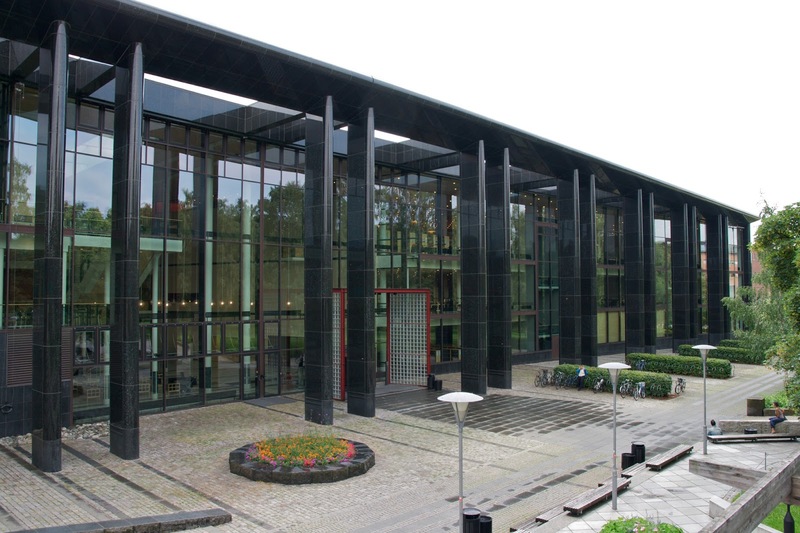 LMR arkitektur, 1999. PS. Fictional Friday will be back, too! Du har utvilsomt mye å bidra med hos LMR arkitektur! Monumental arkitektur er skumle greier, først og fremst fordi den tenderer til å helle mot en overordnet og totalitær symmetry. Alexander selv bruker Alhambra ved Granada som ett av de fremste eksempler på utfoldelsen av denne livsverdien, da Alhambra er fullstendig uten overordnet symmetry, men proppfull av lokale symmetrier.